It might be low on the to-do list, but regularly cleaning your gutters is an essential task when it comes to home maintenance. Why? Because gutters play an important role in funneling water away from your home. And when they’re blocked, littered with debris or in disrepair, the impacts can extend to the very foundation of your home or put your property at risk of natural disaster and the elements. Here’s a quick insight into the hidden impacts of blocked gutters and why they are a non-negotiable maintenance task every home owner should undertake. 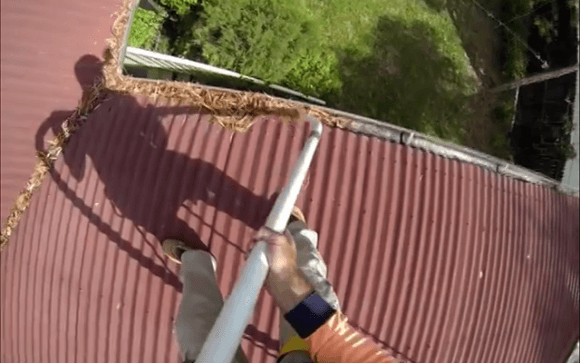 Gutters are a feature of every Australian home because they perform a simple but essential function…they catch the water from your roof and funnel it away from your property. For most metropolitan homes this water is channelled into stormwater, but for about a quarter of the population, gutters also catch and divert water into rainwater tanks for domestic use. In an Australian climate that’s prone to tropical downpours, storms and dry weather, this is no small domestic task. 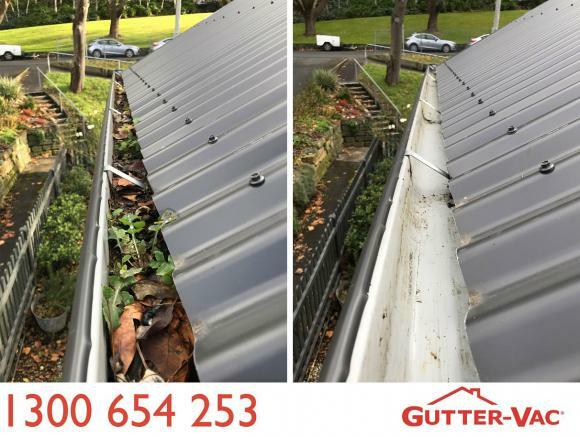 The state of your gutters can affect everything from the quality of the rainwater you drink from your tank to your risk of bushfire and roof leaks. So, what happens when your gutters are blocked? Most people first realise their gutters are full when the water overflows during a rain event. This excess water spills onto the ground, damaging gardens or areas beneath. In heavy rain it can also cause puddles and may even see water entering the property. It’s important to remember the primary function of a gutter is as a channel. And like any channel, if a gutter is blocked, the water will find a way around it, or simply back up. When a gutter backs up in heavy downfalls, the water may then flow into the house, damaging everything from ceilings and plasterboard to electrics. If water is regularly pooling or flowing around the exterior of your property, it has the potential to damage the foundations which can cause very real, very expensive problems for your home. A common problem people encounter when their gutters are blocked or filled with debris is gutter damage, and this occurs for a couple of reasons. Sediment or leaf litter in the gutters causes water to be retained. Over time, this sees gutter joins corrode or causes gutters to become so heavy they may begin to sag. Once gutters sag, the problem is compounded with debris and water pooling in the lowered gutters and causing further damage. Many pests just love a damp environment and their presence can result in both health risks and structural damage. For example, moist soil attracts termites. If blocked gutters are causing regular pools of water outside your property this offers a potential gateway for this devastating pest. Meanwhile, pooled water within your gutters or around your home provides the perfect breeding ground for mosquitoes. In dry and rural areas, full gutters also pose a bushfire risk. This is a particular threat during the hot summer months because dry leaf litter provides the ideal environment for bushfire embers to settle and ignite leaf litter. Around a quarter of the Australian population relies on a rainwater tank as their main supply of household water, and this water is channelled into tanks via your gutters. When gutters are blocked or filled with debris, it not only impacts the water quality, but can also see this valuable resource diverted elsewhere. Every home owner should be looking to clean their gutters at least twice a year, but in many cases it’s prudent to check your gutters more regularly. If your home features overhanging trees, is located in a tropical climate prone to downpours, or is on tank water, gutters may need to be cleaned as regularly as every three to four months. Gutter-Vac is a national company proudly offering the highest quality technicians in the gutter cleaning industry. Each of our technicians is equipped with specialised training in Gutter-Vac’s vacuum technology and provides quality customer service with an emphasis on safety. You can learn more about our services here, or contact us directly to book your next gutter or tank clean. On tank water? Why clean gutters count. Around a quarter of the Australian population relies on a rainwater tank as their main supply of household water, and that figure is steadily increasing, according to the Australian Bureau of Statistics. Renowned as a clean, efficient, and environmentally friendly way of harvesting available water, rainwater tanks also allow householder to cut their expenditure when it comes to domestic water consumption. But they do take maintenance to ensure the available water remains clean and free of contaminants, and clean gutters play a major role as the first line of defence. If you’re on tank water, here’s why clean gutters count. 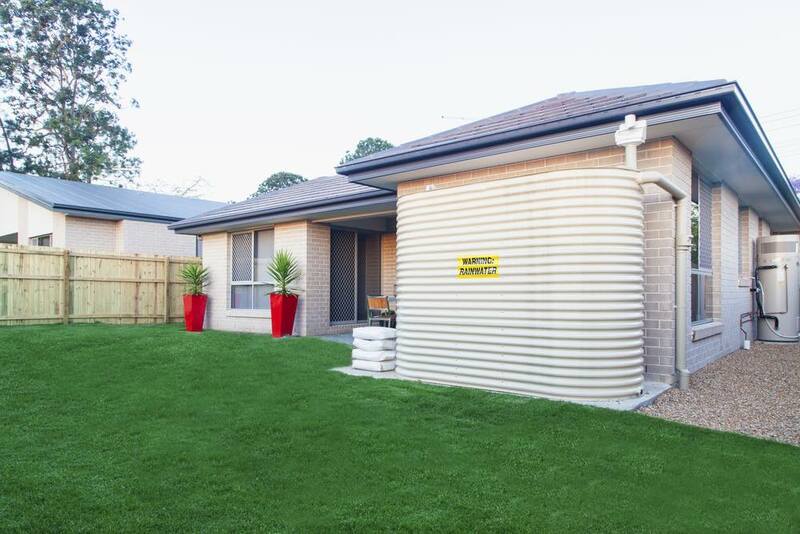 Rainwater tanks have long been a feature of the Australian landscape, with rainwater harvested from roofs and gutters and then held in storage in steel, concrete or large fibreglass and plastic tanks. Each year this collection method accounts for an estimated 177 billion litres, or nine per cent of residential water in Australia worth $540 million. Outside of urban areas rainwater provides 63 per cent of residential water or 109 billion litres. But tank and catchment maintenance are critical to ensure the water remains pure, and clean gutters are an essential element of this process. With proper installation and regular roof, gutter and tank maintenance, there is very little risk of water contaminants in your rainwater tank. However, if inadequately maintained, rainwater tanks have the potential to become a breeding ground for mosquitoes, and some waterborne illnesses. In many ways this comes down to common sense. Just imagine you have rotting leaves, animal excrement and debris in your gutters, or worse a dying animal like a frog or rat in your tank. All this is either filtering into or in the water you are regularly using for domestic purposes. The good news is proper maintenance is easier than many believe. As NSW Health explains: “Well maintained rainwater tanks can provide a renewable supply of soft, clear and odourless water that can be used for a range of purposes” but “the provision of good quality water depends on correct design and installation followed by sensible maintenance of the rainwater tank and catchment area”. • Tanks should be covered to prevent light entering the tank. Light can encourage the growth of algae. Meanwhile, the catchment area (aka the roof and gutters) should also be regularly inspected. If you’re on tank water, it’s imperative your roof and gutters are clear of debris to prevent contaminants like animal faecal matter flushing into the tank. NSW Health recommends this maintenance should be undertaken as regularly as every two to three months. • First, it’s a matter of checking the roof and trimming back any overhanging trees. • Guards like the Gutter Guard can be fitted to minimise the debris that collects in gutters. The Gutter-Vac team has been cleaning gutters for over 20 years, using a proprietary vacuum system to remove leaf litter and debris. That means no mess and no fuss when it comes to cleaning your gutters. In addition, we offer prevention services like the Gutter Guard, to minimise the accumulation of leaves and debris in your gutters. 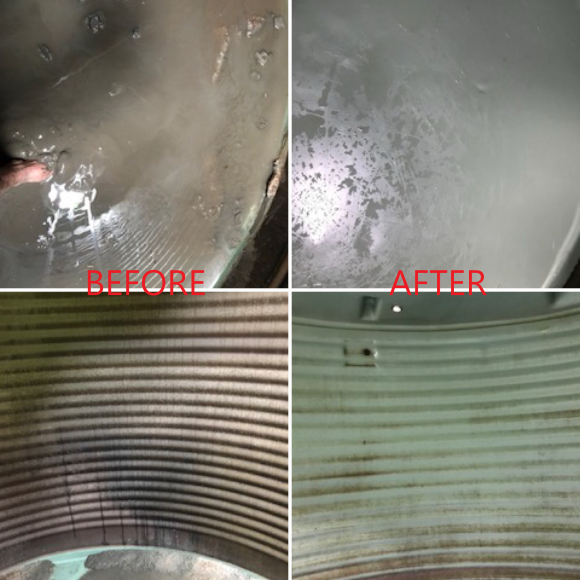 We also provide tank cleaning services to take the dirty work out of regular tank maintenance and can establish a regular gutter and tank maintenance schedule to ensure your tank water is always pristine. In 2010, the ABS found 26 per cent of all Australians used a rainwater tank as a source domestic water, up from 19 per cent just three years prior. They also noted that figure continued to rise as Australians looked to save water and minimise the impacts of water restrictions. Call 1300 654 253 to learn more! Did you know that you need to have your solar panels cleaned? Weather events and nature can cause grime to build up on them and make them less efficient. Even if only part of your solar panel system is dirty, it can cause it to operate at a reduced capacity. Solar panels are difficult to clean if you don’t have specialised equipment, as the glass can easily scratch and mark. Blemishes can significantly reduce the efficiency of solar panels. Even some cleaning solutions and powders can mark the glass. 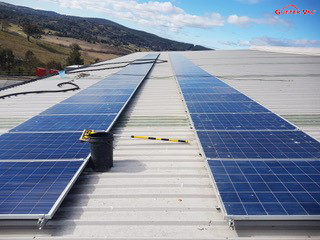 At Gutter-Vac, we can clean your solar panels using a soft brush vacuum and/or demineralized water to achieve the optimal result while keeping them unblemished and safe. …that we complete a roof and gutter report as part of our service? Have peace of mind! Whilst we are on your roof, we carry out a complimentary roof and gutter inspection. We can make note of any issues such as rusting gutters, cracked tiles, problems on solar panels or any issues that might harm the integrity of your roof and gutters. Property Managers LOVE this service! Why? Because they can send this report to the owners of the property to see any maintenance that may need to be carried out BEFORE a problem occurs AND it gives the property manager one more value add to their clients! Give us a call today on 1300 654 253 to ask us more. While clean gutters can definitely improve the appearance of your home, they can also protect your home from serious damage. In the event of severe weather, or a bushfire, clogged gutters put your home at serious risk. Embers can find fuel in gutter debris, setting your house alight. Clogged gutters and downpipes can cause water to overflow into your roof and ceiling. Getting your gutters and roof professionally cleaned can add years to the life of your house because it minimises rust. Did you know that debris left in gutters breaks down and forms a destructive sludge?This acidic sludge causes the formation of rust, which often corrodes gutters past the point of repair. Did you know that you could be inadvertently voiding your home insurance if your gutters and downpipes are blocked? In the event that something goes wrong, you may not be protected if your gutters haven’t been maintained. The benefit of having your gutters professionally cleaned is that in the case of disaster, you will have evidence of being proactive. At Gutter-Vac, we offer a preventative maintenance plan. We do the worrying about maintaining your gutters for you! 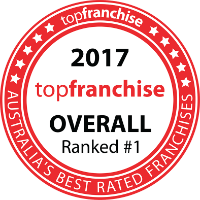 Call 1300 654 253 or fill out the ‘Get A Quote’ form on the website, and your local Gutter-Vac technician will call you for a chat. 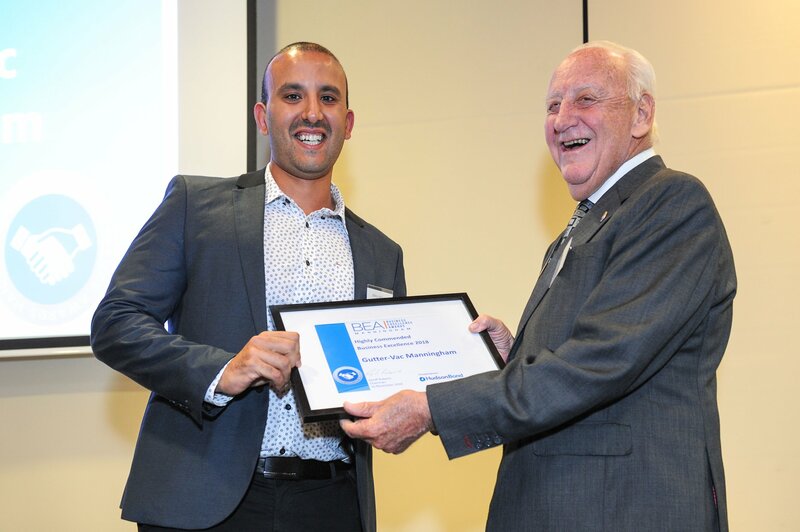 Congratulations to our franchisee Mina Moussa from Guttervac-Manningham, Banyule and Whitehorse for receiving a Highly Commended Award at this year’s Manningham Business Excellence Awards. Please join us in congratulating Mina on his well-deserved success! Australia has a generally hot, dry climate and fresh water is a limited and valuable commodity. Collection of rainfall from roof run-off is an ancient practice that dates back over 3000 years! Even in areas that receive mains water, many households collect rainwater in tanks to augment supplies or provide an alternative and renewable source of water. The Health Department guidelines for tank cleanliness state that “In addition to six-monthly inspections, tanks should be inspected every 2-3 years for the presence of accumulated sediments. If the bottom of the tank is covered with sediment the tank should be cleaned.” Scarily, decaying leaves, algae, faeces, and dead animals are commonly found in water tanks that aren’t regularly serviced! Using our specialised vacuum system, Gutter-Vac can clean your water tank while it is still full of water, leaving your tank debris and bacteria free. Our trained and qualified technicians will vacuum the floor of the water tank to remove all build-up of sludge and sediment. Our methods are environmentally friendly – they minimise water loss and use no chemicals, so you can be assured that we’re leaving your tank in even better condition than before. See http://www.health.gov.au/internet/publications/publishing.nsf/Content/ohp-enhealth-raintank-cnt-l~ohp-enhealth-raintank-cnt-l-1 for more information about water tank use and care. Is something slithering in your gutters? There are many species of snakes in Australia that happily live in the bush land surrounding our towns and cities. Due to a lack of understanding and familiarity many people are frightened of snakes but remember that most snakes simply want to get away from you. 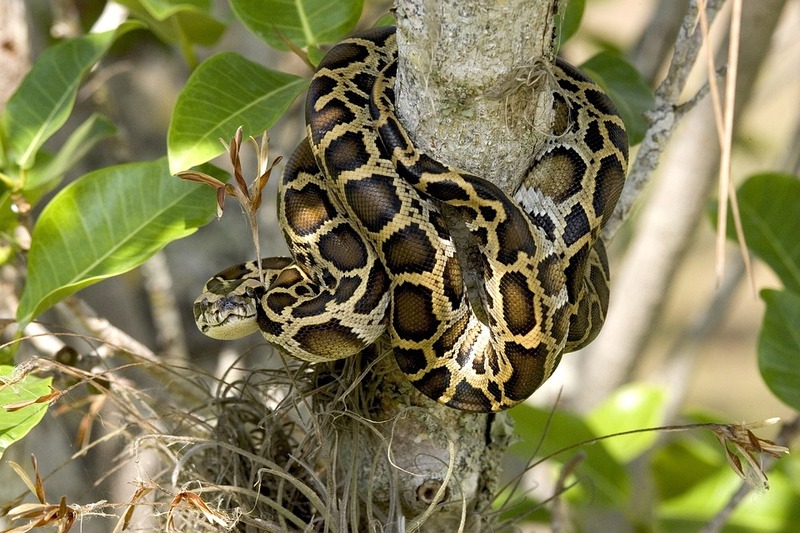 Tree snakes and pythons are both harmless and commonly found in gutters and gardens as the weather warms up. If you see a snake, its recommended that you leave it alone and wait to see if it moves on. If it remains nearby or you think its stuck inside a building, you should call a licensed snake catcher to investigate. Homeowners should be aware that feeding pets outside and keeping chickens and guinea pigs will attract rodents, which in turn can attract snakes. Keeping a clean and tidy garden, and not leaving pet food outside, will reduce the risk of snakes visiting your property. Another maintenance tip for keeping snakes from taking up residence at your place is to have your gutters cleaned regularly. This prevents the gutters from becoming clogged with leaves and twigs – an ideal home for rodents and the snakes that prey on them. Our technicians can not only help you by vacuuming out the build-up in your gutters, but also with a Preventative Maintenance Plan for keeping them clean and keeping the creatures away! Give us a call today on 1300 654 253. We usually think of sunburn as something that happens at the beach. But did you know that most Australians get sunburned during day-to-day activities like hanging out the washing, watering the garden, doing yard maintenance or having a weekend BBQ? Over time, this UV damage can result in premature ageing, sunspots, eye damage and ultimately, skin cancer. To prevent UV damage and cut your risk of skin cancer, protect your skin this summer and leave some of those outdoor jobs to others. Gutter-Vac technicians follow sun-safe guidelines including wearing long sleeves whenever possible, applying SPF 30 (or higher) sunscreen at regular intervals, wearing a hat that protects the face, ears and neck and wearing wrap-around sunglasses. This summer, if you have outdoor jobs like gutter cleaning, pressure washing or solar panel cleaning, why not leave it to the experts? Call us on 1300 654 253 and save your skin! Australia is one of the most fire-prone countries on earth and bushfires can cause widespread devastation. In the right conditions, a small fire can quickly become a massive one if not quickly controlled. When weather, topography, vegetation and fuel combine to defeat the best efforts of firefighters, bushfires can cause millions of dollars in damage and claim lives. With bushfire season on the horizon, experts are warning that people should begin preparing early and take steps to protect their home. Residents who live in high-risk areas are being urged to take precautions and prepare by putting together a fire-survival plan and taking practical steps around the home. Local fire services recommend that you have your gutters regularly cleaned to help protect your home and reduce the spread of fire. 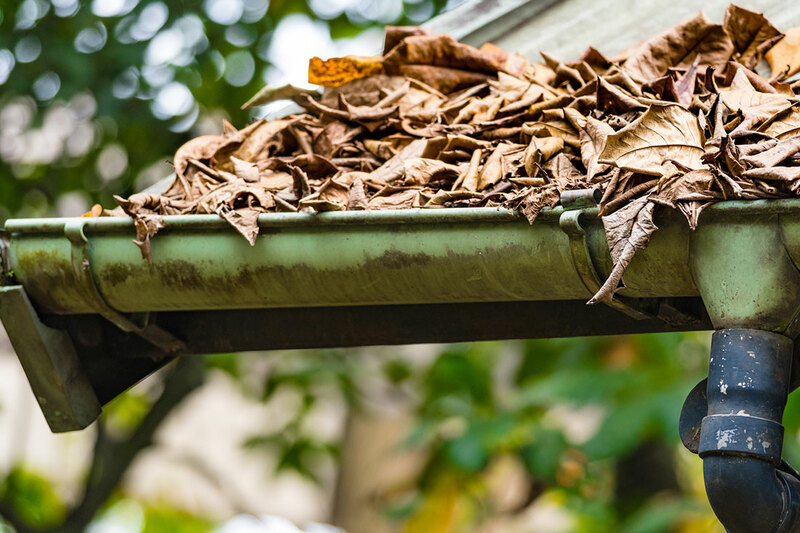 It is important to ensure that your gutters are free from any debris, as leaves can act as fuel for stray embers. 90% of homes caught in a bushfire are lost to “ember attack”, where spot fires are ignited by burning twigs, leaves or pieces of bark that are carried by the wind. These embers can land in a home’s guttering and ignite the property if the gutters have not been well-maintained. It is recommended that all homeowners in bushfire prone areas have their gutters professionally cleaned before it is too late. Be proactive and get your home prepared today. 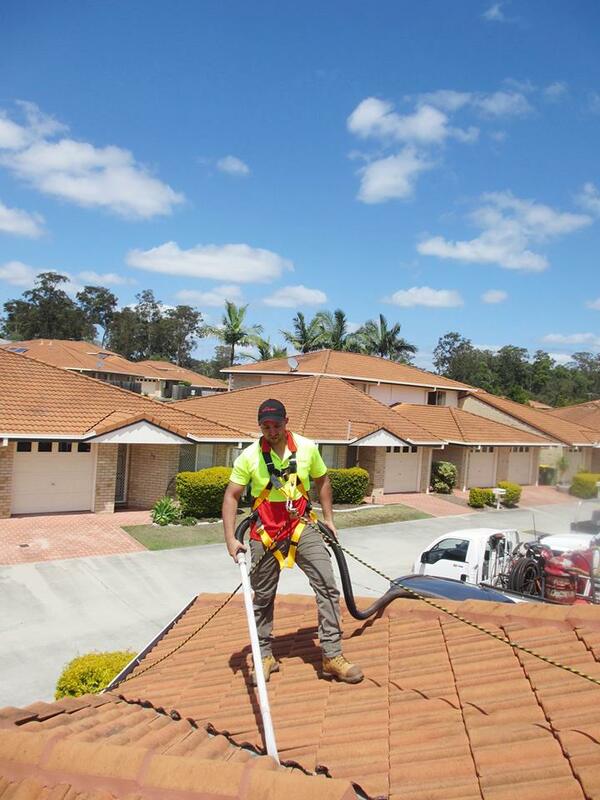 Call the gutter cleaning specialists on 1300 654 253.